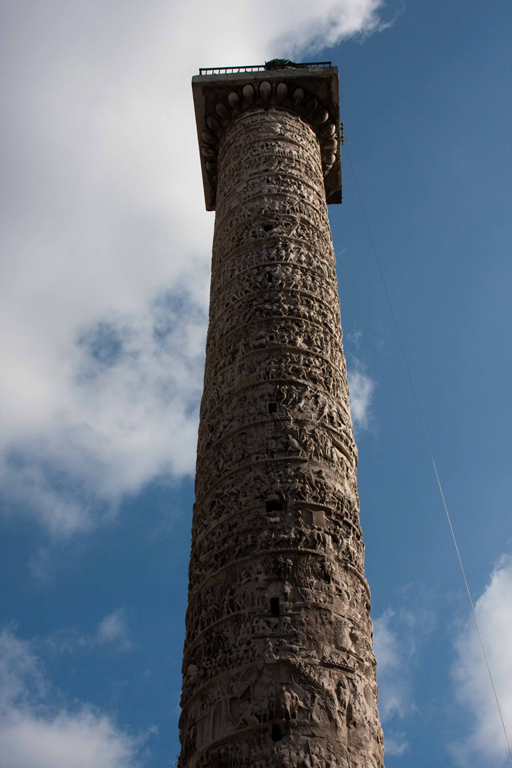 The Column of Marcus Aurelius, (Latin: Columna Centenaria Divorum Marci et Faustinae), is a Doric column, with a spiral relief, built in honour of Roman emperor Marcus Aurelius and modeled on Trajan’s Column. 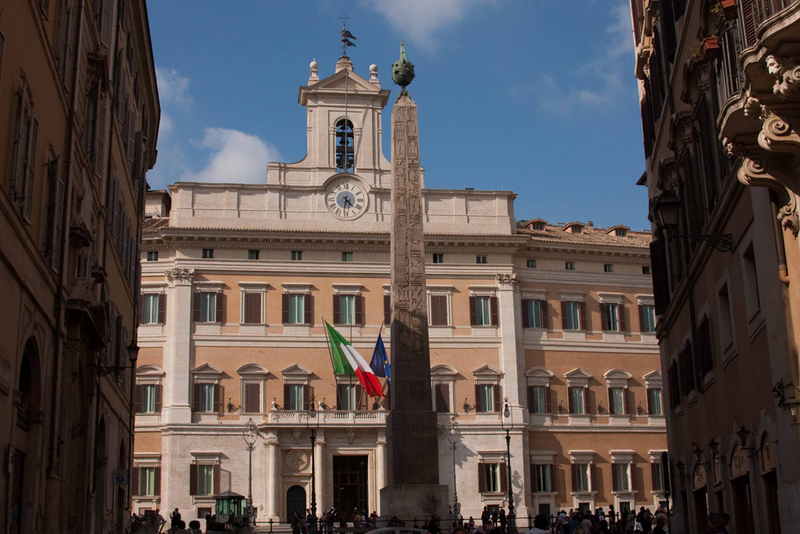 It still stands on its original site in Rome, in Piazza Colonna before Palazzo Chigi. The spiral picture relief tells the story of Marcus Aurelius’ Danubian or Marcomannic wars, waged by him from 166 to his death. The story begins with the army crossing the river Danube, probably at Carnuntum. A Victory separates the accounts of two expeditions. The exact chronology of the events is disputed, however the latest theory states that the expeditions against the Marcomanni and Quadi in the years 172 and 173 are in the lower half and the successes of the emperor over the Sarmatians in the years 174 and 175 in the upper half. One particular episode portrayed is historically attested in Roman propaganda – the so-called “rain miracle in the territory of the Quadi”, in which a God, answering a prayer from the emperor, rescues Roman troops by a terrible storm, a miracle later claimed by the Christians for the Christian God. The detail is spectacular, hundreds of years later. Right beside it is the Piazza Montecitorio, with a liberated Egyptian obelisk. The obelisk was originally constructed for Pharaoh Psammeticus II. It was set up in Heliopolis in the sixth century B.C. Emperor Augustus had it shipped to Italy in the tenth century B.C. to celebrate his victory over Cleopatra. It was set up in the Campus Martius. When he brought it to Rome it created a great stir that it is said that the ship, which transported the obelisk, was also kept on public display. t was set up as a gnomon (shadow caster) for an enormous sundial he had built a few hundred metres north of the present location of the obelisk. Legend says that it fell during a fire and was buried there until it was rediscovered in 1748 under a building in Piazza Parlemento. In 1792 it was reconstructed using granite taken from the column of Antonius. Today it stands almost 22 metres high or should one say 29 metres including the base and the globe surmounting it. Wandering through Rome was a wonderful experience, piazza upon piazza. Well worth planning some ‘wandering time’. The next day, the touring started. 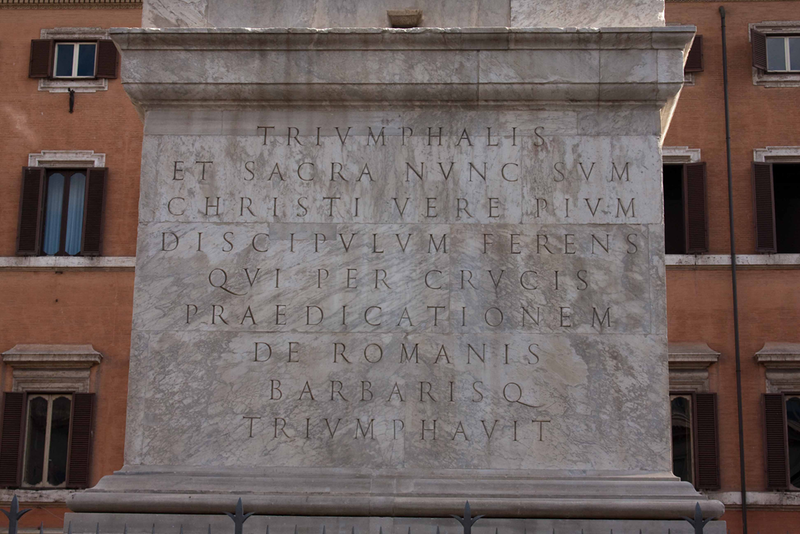 This entry was posted in Travel and tagged Column of Marcus Aurelius, Egypt obeslisk, Italy, Piazza Colonna, Piazza Montecitorio, Rome by michaelweening. Bookmark the permalink.